mIRC is a very popular software that is used to connect to IRC servers and chat anonymously with other users. The overall usage of IRC has declined a lot over the past few years with users jumping ship to instant messengers such as Windows Live Messenger, and now to mobile chatting applications such as WhatsApp, Viber, Skype, WeChat, etc. Although IRC is not commonly being used these days, there are still some small and independent companies that uses IRC as a channel to offer free chat support. Downloading and installing an IRC client software such as mIRC just for a quick use may seem a bit overkill. Other than that, it is also possible that a firewall in a company or educational facility may be blocking port 6660-6669 and 7000 (SSL) used by IRC. An easier solution to avoid installing unnecessary software and bypassing your firewall restriction is to use a web-based IRC client. All you need is a modern web browser and an Internet connection. Since a web based IRC client uses port 80 instead of 6667-7000, it is able to bypass most firewalls because firewall policies normally allow port 80 for their users to access websites. Here we have a total of 6 ways for you to quickly get connected to IRC servers without relying on installing third party software. Connecting to a IRC server is as easy as choosing a network from the drop-down list, specify the nickname that you’d like to use and finally the channel that you want to join. If you’re looking for a specific channel of interest, simply use the search function to look for a channel that matches your keyword. Do note that Mibbit uses your IP address to connect to the IRC servers which would mean if you’re banned from a channel or even an IRC network through G:Line, you still won’t be able to connect to the server unless changing your IP or connecting to a VPN. Kiwi IRC is another web IRC client that is similar to Mibbit except it is totally free and open source. 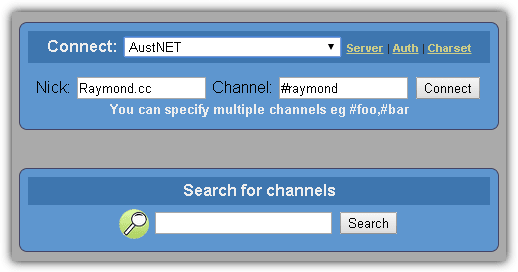 Chatters can use their web IRC client to connect to IRC servers and start chatting while webmasters can embed a Kiwi IRC widget on their website to create an online community. The Kiwi IRC interface is fast, modern and clean without any advertisements. You can change a few settings such as choosing a theme, channel display via tab or list, time stamping, muting notifications, emotions, language, and join or part channel notifications. The current WSIRC 2.0 beta is still a work in progress aiming to improve stability and lower latency. 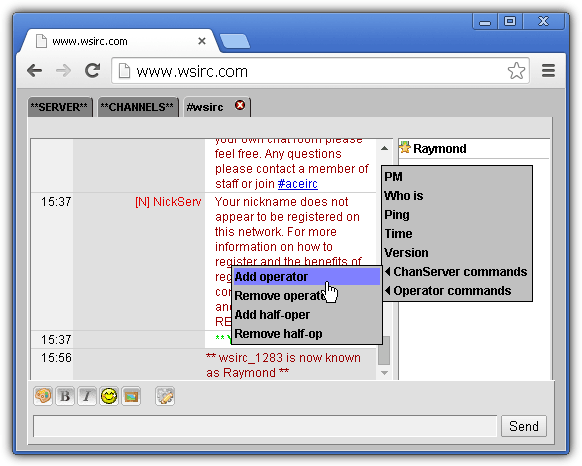 The design of WSIRC web IRC client looks a bit dated but any mIRC users would be familiar with the options since they are located at common places similar to mIRC software. A list containing pre-configured IRC server hostnames and port numbers are available to choose from. For users who are not familiar with IRC commands, WSIRC comes with a built-in ChanServ and NickServ commands to assist in registering channel or nickname without learning the commands. 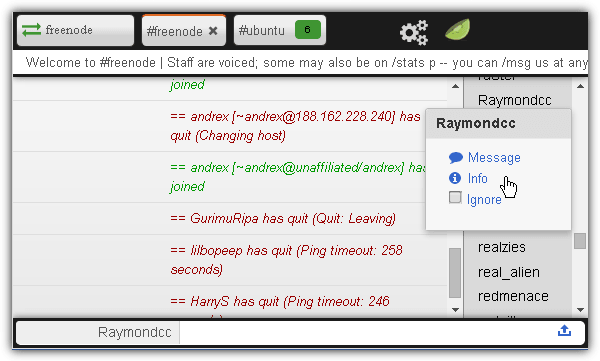 IRCCloud is similar to psyBNC, an IRC bouncer that keeps you online all the time even when you’re disconnected. 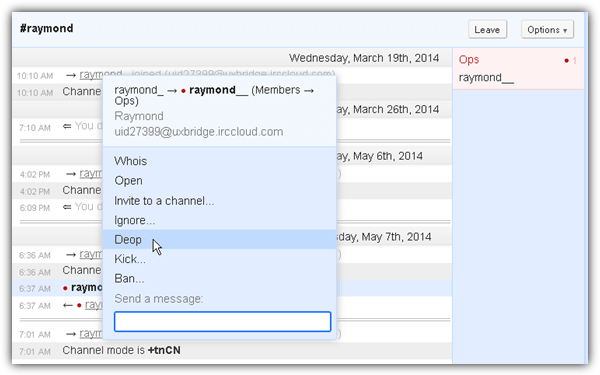 An advantage in using IRCCloud is that all private and public channel messages are being logged and you can read them when you get back online. IRCCloud is actually a paid service but they offer free limited accounts that only keeps you online for another 2 hours after you go offline and also limits you to 2 external networks. Another advantage in using IRCCloud is they masked you real IP address with their hostname but a unique IRCCloud ID is attached to your Identd. CGI:IRC is one of the most popular if not the most popular free web based IRC client script that runs on Perl/CGI. The CGI:IRC demo at their official website is hard coded to connect to irc.blitzed.org and does not allow you to connect to another external IRC network. What you can do is use a specially crafted search string at Google to look for other websites that are hosting the CGI:IRC program which has an editable text box for servers to specify the external IRC network that you want to connect to. As you can see on the screenshot above, the Server information text box is editable and not grayed out. Do take note that not all of the results shown in Google contain a server text box that is editable as most of them aren’t. From what we’ve noticed, there is mostly one in every search result page. Connecting to an IRC network using CGI:IRC will hide your real IP address while the IP/hostname of website hosting the program will be shown instead. 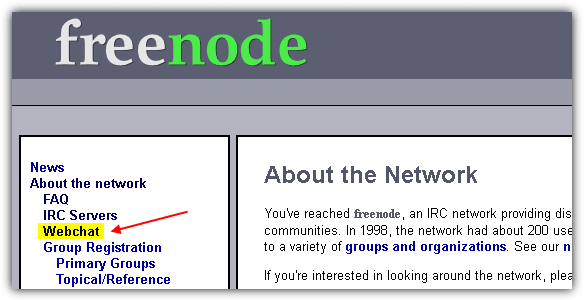 Most IRC network official websites offer a web based IRC client to connect to their servers. For example, IRCnet uses CGI:IRC while QuakeNet, EFnet, Rizon and freenode uses qwebirc. 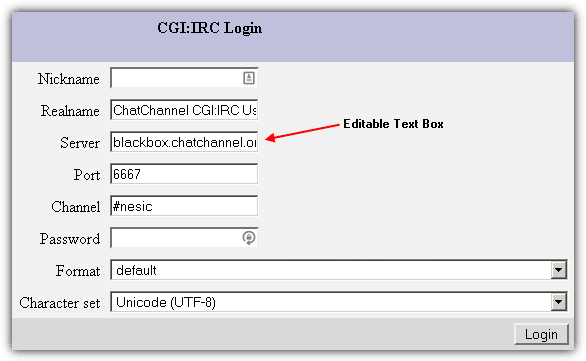 Simply look for the word “Webchat” or “Chat” on their respective websites to connect to their IRC servers without installing a IRC client such as mIRC. For your convenience, IRC.LC maintains a list of web based IRC clients offered by the official IRC networks. Although the number of IRC users has dropped drastically if comparing the statistics today with 10 years ago, there are still half a million of IRC users every day according to irc.netsplit.de.